The second print in the Double Bind series. 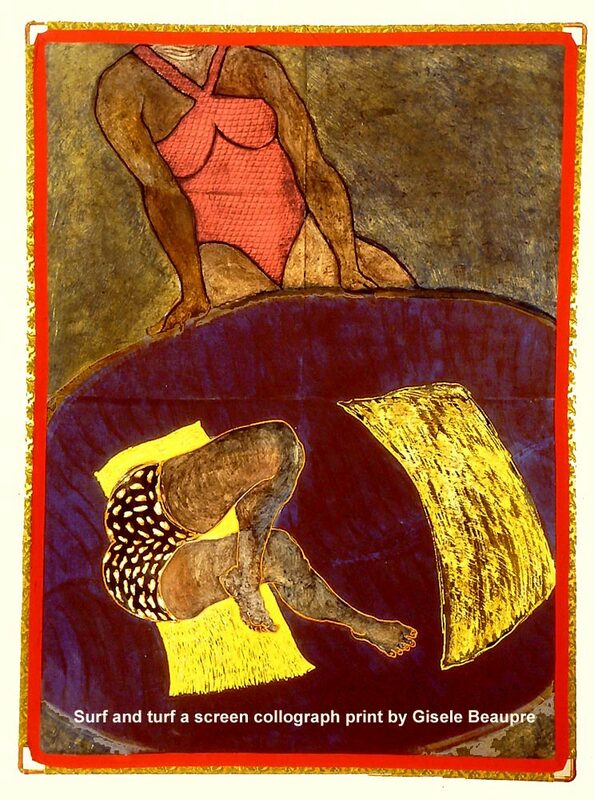 Medium: a Screen Collograph print. (60"x 80") in two sessions, on one piece of fabric. It is 1 of 1 - actually a monoprint. There are 3 variations on various fabrics and one on paper of this image. This is a cut-plate colour process; the matboard plates are cut apart, inked separately and then printed together. 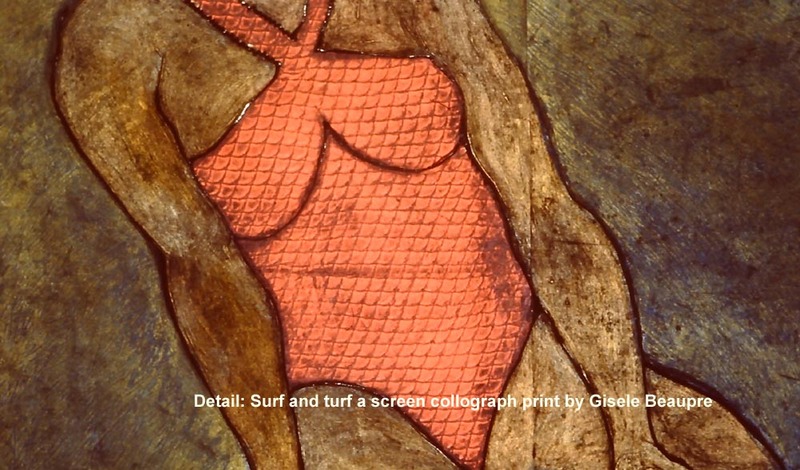 The red bathing suit of the upper figure is part of the cut plate process. 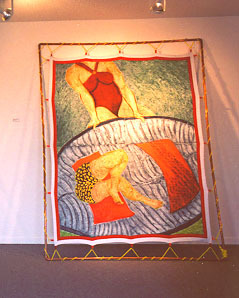 The orange on the boat seats, and the yellow patterning on the seated figure are painted with acrylic. borders were machine sewn with tabs and metal half circles to hold the yellow plastic cord. The yellow cord ties the print onto the copper framework, further suggesting nautical or water related codes. In the second chapter of this nautical tale, something happens...the calmness of being a single entity is disturbed by seemingly outside forces, yet the figure remains suspended in the boat. The blueness of the water is reversed here as it becomes the colour of the inside of the boat. What was seemingly external becomes internal. This print has been exhibited as shown and also stretched upon a frame that is elevated, as if it is a bed. Other symbols such as the copper pipes etc. are discussed on the philosophy page. So some sense of equilibrium is seemingly destroyed here yet there is a constancy...the seat of the seer is undisturbed. The figure is setting casually with one leg crossed over the other. There was a specific irratant that influenced the creation of this piece. The experiences forced me to dig deeper into the emotions; their nature and results...and it led me to a vaster, and broader perspective of the situation, more understanding about myself, the nature of duality and the tricky but ultimate self-unity. It is my experience the audience will naturally project their own ideas on to the content of this or any piece. What they add is their own observations, experience and interpretation of the symbols, relationship and other signals. The image is a bit disconcerting to many because of the lack of a whole body and no faces. That is part choice, part chance, part interpretation. Not everything has to be delivered in literal terms. Filling in the missing pieces is partly the role of the observer or interpretor.